Undereye bags are a fact of life for many people as they go from their 30s into their 40s and beyond. We wish the solution were as simple as dabbing on an eye cream, but it’s not that easy. That’s because the causes of undereye bags are more than skin deep! In almost every case, you’re not going to fix undereye bags with skincare products; if you’ve tried this route, we suspect you’ve been disappointed, and here’s why: what’s happening beneath the skin is due to a complex combination of sun damage, gravity, bone loss, and other age-related changes that skincare alone cannot address. So, what’s the best way to fix undereye bags? According to scientific research (a lot of research), a surgical procedure known as blepharoplasty is the answer. Blepharoplasty is among the most common surgeries performed today because it literally removes undereye bags, making you look years younger (bye-bye, tired and sad expression!). Blepharoplasty can be performed on both the upper and lower eyelid areas. If your only concern is bags under the eyes, you would have a lower blepharoplasty. In this procedure, a surgeon uses one of two primary methods to access the drooping fat pads and supportive tissue; both methods leave only tiny, discrete scars. In some cases, excess fat and skin are removed before the remaining fat pad is secured back into its original place. For younger patients, it’s typically a much simpler process of repositioning and securing the fat pad to keep it from pouching beneath the eye. After a brief recovery period, the undereye bags are gone! We repeat: Gone! Must-know: Although the majority of people who’ve had blepharoplasty are pleased with the results, there are risks and possible side effects to be aware of and discuss with your surgeon before the procedure is done. A great cosmetic surgeon or oculoplastic surgeon (a doctor who specializes in eye surgery) will examine your entire eye area and upper cheek area to determine if you might benefit further from other treatments, such as lasers, dermal fillers, or a different surgical procedure to address loose eyelid skin. Many people with age-related undereye bags are also dealing with facial volume loss and deeper sun damage, which a mix of in-office procedures can improve. 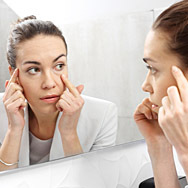 Although skincare cannot treat undereye bags that result from age, it does have its place. A great anti-aging skincare routine that includes an eye cream or eye gel can beautifully address texture and hydration issues as well as concerns such as visible loss of firmness and the look of fine lines and wrinkles, all of which make the undereye area look better. And, of course, daily use of a broad-spectrum sunscreen rated SPF 30 or greater will help keep the eye area looking younger and healthier, no matter which in-office methods you choose to deal with undereye bags.